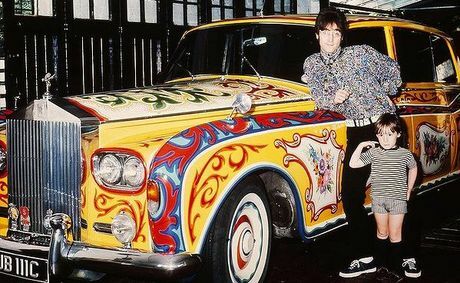 I’ve had an update on the latest whereabouts of John Lennon’s Rolls Royce from one the men who helped restore it, and on the portable Sony TV which used to be installed in the rear passenger area of the car. That television was possibly the one also featured on the front cover of the Sgt Pepper LP, although there is a bit of mystery surrounding that little Sony. Jim Walters works at Bristol Motors in Victoria, British Columbia in Canada and they have been the custodians of John Lennon’s famous Rolls Royce since 1993. The car is actually owned the Royal British Columbia Museum, which for a long time has been looking for a replacement portable Sony TV to install into the space where the original used to be – one just like a Sony model TV9-306 UB – the one on the “Sgt Pepper” cover. Thanks so much Jim for the update – and anyone living in or travelling to Montreal in the next year should drop in to see “The Beatles in Montreal” exhibition. You can find more details on that here. The exhibition opens on March 29 and runs for a year. With 2014 being the 50th anniversary of the Beatles first world tour there are a number of museums, including here in Sydney and in Melbourne Australia, planning exhibitions of their city’s brush with Beatlemania…. This entry was posted in Beatles, Beatles Collecting, Beatles Related, John Lennon and tagged Beatles, Beatles Collecting, Beatles Related, John Lennon, Montreal, Rolls Royce, Sgt. Pepper by beatlesblogger. Bookmark the permalink.